Folk has gone big. The roots of bands like Mumford & Sons may be humble, but try looking me in the eyes and telling me that something like “Little Lion Man” won’t get a crowd of twenty-thousand fans roaring. Over the past few years, the genre has experienced a popular rebirth with artists reinventing the genre from a variety of new perspectives, bringing it to an unprecedented mass audience. Swept up in this bravado is Bell X1, who rides the wave to success on its LP Chop Chop. On its latest, Bell X1 claims to have gone back to simpler times, and the album’s minimalistic tendencies reflect this newfound less-is-more ethos. From the drizzle of the drums and the sunken swirls of piano that open “Starlings Over Brighton Pier,” it’s clear that the band has a penchant for meticulous construction, building fortresses from LEGO blocks. As barren as the music is on its face, it’s not lacking for depth when it comes to atmosphere. The song’s as sparse as a cornfield, Paul Noonan’s ghostly vocals haunting the fray with nary a scarecrow to be found. The production in particular deserves commendation for creating an atmosphere of intimacy, striking a balance between wistfulness and majesty but leaving ample room for lots of slightly off-kilter breaths and notes. 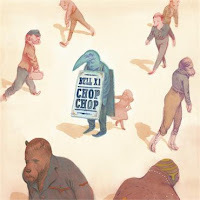 If Chop Chop is a bit of a scraggly album, it's also plenty forceful. A delicate piano line kicks off “A Thousand Little Downers,” but the toms pound their way through the walls, Noonan’s vocals pick up steam, and before long, it’s bloomed into a delightful piece of garage-folk replete with booming slabs of bass guitar and trumpets scribbled about. It’s loud, but it’s more. It’s dense, as if the band’s dribbling breadcrumbs everywhere for us to pick up. “I Will Follow You” features chirpy percussion, groovy bass lines and a slightly warmer rustle in Noonan’s voice. There’s still a charmingly down-to-earth vibe to the affair, but there’s grandeur to spare as well. Chop Chop also showcases some top-notch songwriting. Throughout the album, Bell X1 avoids painting pictures with broad strokes, trying instead to layer different moods as it works the scattershot into a cohesive portrait of emotional complexity. This focus on conveying intensity through density rather than dynamics is a boon in the album’s quieter moments. “Careful What You Wish For” makes a storm out of understated melancholy: piano dripping like rain, handclaps clattering like thunder on the horizon, bass drum stirring up heat on the plains. Meanwhile, the charming “Diorama” doesn’t so much move forward as it rocks back and forth. The piano is rooted in chord patterns echoing through the track while the horns in the background play an icy elegy. Even the sudden charge forward in the song’s final moments has glacial overtones. Though Bell X1 has honed in on a strong set of musical principles, Chop Chop does flag a little in its second half. A sunny ode to lost times, “Drive-By Summer” is affable but a little too sleepy to really leave a mark (though in fairness that may not be the point). “Motorcades” does little to revive the album’s pulse, either: there’s a buzzy energy throughout Chop Chop as Bell X1 weaves folk into other musical movements, and it wanes a bit when the band loses its sense of adventure. As the album settles into a relaxed second half, it also sinks into a sort of USA Network complacency: it’s pleasant to listen to but only rarely reaches the engagement level of the stronger tracks in the first half. To the band’s credit, it kicks back into gear just in time. “The End Is Nigh” is both the end of the album and the end of the world: fittingly, it’s also one of the best tracks on Chop Chop. Though it continues the album’s late upbeat streak, with math-pop prowess rivaling that of Two Door Cinema Club, it also ups the emotional stakes and delivers a much more memorable experience for it. Though Chop Chop falls just short of a top-notch album, it's an impressive reminder of just how much can be done with so little. Bell X1 may yearn for simpler times, but its latest is rich with emotional and musical depth. These are the thoughts we keep to ourselves, bite our lips so they don't slip out, the thoughts that only a poorly-lit stage and a splintered guitar can illuminate. Folk has gone big. Chop chop.